Another day and another watch of a film eligible for an award in the 2017 Fright Meter Awards. Personal Shopper is up for Best Screenplay while Kristen Stewart (the Twilight series) is up for Best Actress in a Leading Role. Sometimes a film doesn't have to be bad for me to give it a middling score, that is the case with this film that I couldn't get on board with due to my own stupidity. My best friend once said I never pay attention when watching films and that is the case on at least two pretty big occasions here. So some truth bombs...first off Lewis has a widow in the form of Lara (Sigrid Bouaziz). Until fifteen minutes were left before the end of the movie I thought Lara and Kyra were the same character, this led up to a very confusing moment. Due to thinking this my view of characters relationships was pretty incorrect which did impact on my enjoyment. Secondly there is a key scene in this film that I possibly wasn't paying attention to, it seemed to be like the plot was moving on up to this dramatic showdown, but when this showdown occurred it was farcical and rushed leaving me very muddled. The whole introduction of the creepy mysterious texter gave Personal Shopper much more of a thriller edge to it, it was clever in that Maureen had been tricked into doing certain actions that would reflect badly on her. I was well on board to see this plot thread resolved but even putting aside my denseness it was very unsatisfying with Maureen pretty much explaining the resolution to a friend after the fact. This is an intelligent movie that doesn't spell out anything to the viewer, it makes you work for answers, but creepy texts aside the horror aspect is very light and hidden away. The plot of Maureen trying to contact her dead brother becomes almost a small sub plot to her daily life of running around fetching clothes for Kyra. Much of what occurs here is far more of a drama than anything approaching the horror genre. It makes the paranormal scenes stick out like a sore thumb. Now I actually enjoyed the final ten minutes, it had some effective ghostly moments that raised questions, it is more the one pure horror scene that I had issue with. Most the film events are all very subtle, then we suddenly get a big scene in which Maureen encounters the spirit of an angry woman who flies around and screams a lot. This scene did not feel like it belonged to Personal Shopper in any way, this one scene seemed fantastical when the rest of the movie is so very down to earth. I couldn't get over the feeling that this was a bizarre interloper in terms of flow. This features a lot of foreign actors which is unsurprising when it takes place in Paris, all the acting was of a high standard, especially with Stewart. I have only previously seen her in the Twilight series so I didn't even twig this was the same person with how fantastic and authentic a performance she gives here. If I never thought she was that good an actor my belief has now changed as she gets into the character seamlessly. I didn't feel like the script was stunning though, the lines are all good it is just that occasionally it seems a little pretentious and clever when more simpler language would have sufficed. I did think the directing was good stuff, some really well framed shots here, and the editing too gave the film the room it needed to breath. 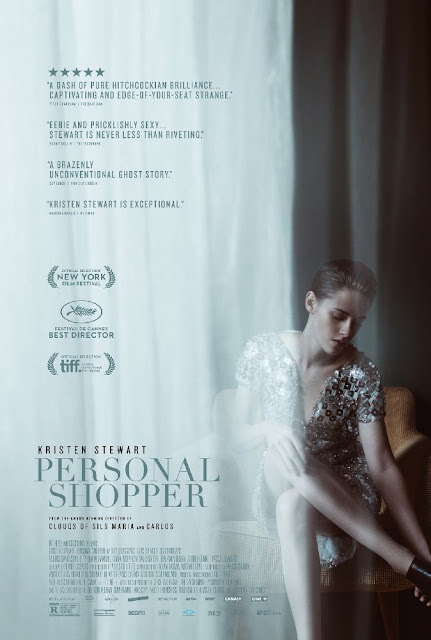 Personal Shopper isn't a bad film, it just caught me at a time when I wasn't really suited to seeing it, this is something to mull over and not one to watch when tired from the daily grind. In some ways it is my own fault that I didn't get on with this as I should have but in other ways I had valid points, there are some elements of this film that just didn't work for me. Personal Shopper is currently on Netflix.